The Walt Disney of Saving Mr Banks might barely recognize the company who currently partner Pixar and Marvel, but he’d be right at home with Frozen, adapted freely from Hans Christian Andersen’s The Snow Queen. This long-gestated project springs to animated life via directors Chris Buck and Jennifer Lee, and returns to familiar Mouse House values; no celebrity voice-overs, no pop-culture gags, just a venerable story with hummable songs and charming light relief. It may be old-fashioned, but it’s also as close to an instant classic as family films get. Princess Anna (Kristen Bell) is upset when her sister Elsa (Idina Menzel) reveals her secret ability to create ice and snow. Elsa goes into exile, not realizing that the rejection has caused her emotions to lock the whole kingdom of Arendelle in icy conditions. Anna’s quest to find her sister is supported by rugged mountain-man Kristoff (Jonathan Groff), reindeer Sven, a cheerful snowman called Olaf (Josh Gad) and a sea of singing trolls. In synopsis, Frozen may sound somewhat cold potatoes, but what distinguishes it from Disney’s recent animations (Tangled, The Princess and the Frog) is that all the elements work; both Olaf and Sven are classic comic relief characters, and the songs, by Book of Mormon / Avenue Q writer Robert Lopez and his wife Kristen Anderson-Lopez are sheer delight; aside from the tuneful power-ballads 'Do You Want To Build A Snowman? ', 'Let It Go' and 'For The First Time in Forever', the subversive highlights are the snowman’s wonderfully blithe song about summer, and the match-making trolls' stirring rendition of 'Fixer Upper'. If Frozen has a weakness, it’s almost too well-stuffed with entertainment to take in at one sitting; perhaps this is a design feature, as Frozen’s warm and fuzzy grip will last for many Christmases to come. 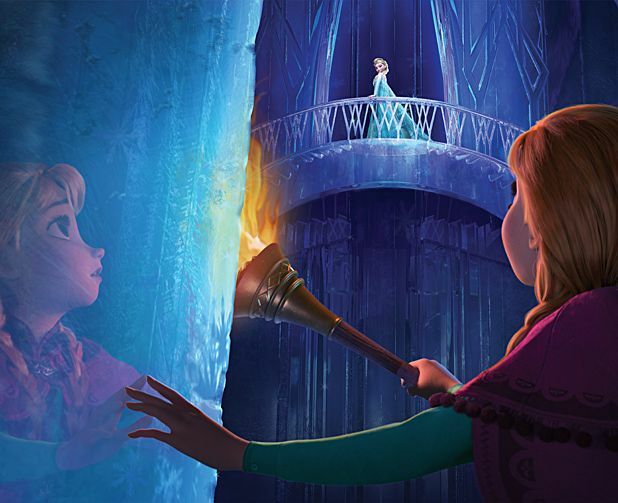 General release from Fri 6 Dec.
Princess Anna (Bell) is disturbed to find that her sister Elsa (Menzel) can create ice and snow, but when Elsa goes into exile the kingdom freezes, and Anna and friends must find her. With no celebrity voice-overs or pop culture gags, just a venerable story, good songs and classic characters, it's an old-fashioned delight.